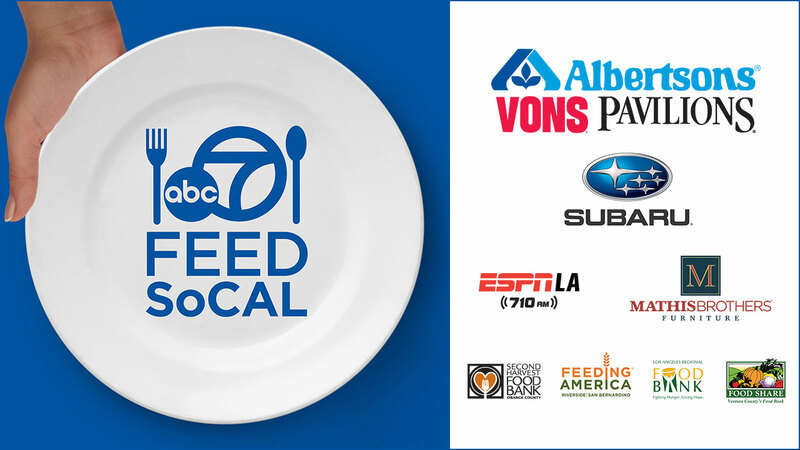 ABC7, Albertsons, Vons, Pavilions, Subaru, ESPN LA 710 am, Mathis Brothers and Southern California regional food banks are partnering up for the 7th Annual Feed SoCal hunger initiative throughout Southern California. The initiative will take place during the month of June and will include the following food banks in Southern California: Los Angeles Regional Food Bank, Second Harvest Food Bank of Orange County, Feeding America Riverside/San Bernardino and FOOD Share, Ventura County's Food Bank. During difficult economic times, one out of every seven people in Southern California experiences food insecurity, and especially during the summer, children, veterans, and the elderly hurt the most. Food banks need your help. 1. - Go to your local Albertsons, Vons or Pavilions and purchase a pre-filled $5 bag; purchase other non-perishable food items; or take your own non-perishable food items, and leave them in the Feed SoCal box. 2. - Go to your local Subaru Dealership and drop off non-perishable food items and leave them in the Feed SoCal box. 4. - Come out to one of our four "Stuff-A-Truck" events and bring non-perishable food items, cash, check or credit card, and help "Stuff-A-Truck" for Feed SoCal. Friday, June 15th from 4:30 a.m. to 6:30 p.m.
Friday, June 22nd from 4:30 a.m. to 6:30 p.m.